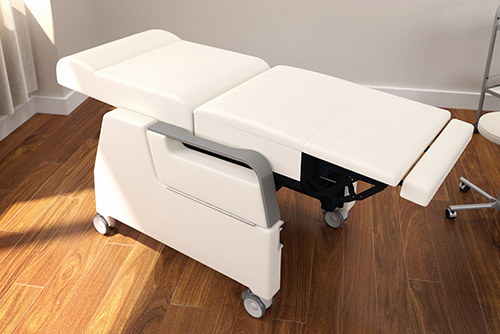 Named in honor of Florence Nightingale, and initiated by Contract magazine’s editors and The Center for Health Design’s founders in 1990, the Nightingale Awards recognize products that are juried by seasoned healthcare design professionals and healthcare facility managers. The jury makes selections based on the product’s contribution to a healing environment, functionality, quality and durability, aesthetics and style, pricing, and innovation. To evaluate the entries, jurors visit the exhibitors’ booths before the show floor opens at the Healthcare Design Expo & Conference to examine the products in person and ask questions of the manufacturers as well. View the 2018 winners of the Nightingale Awards below. Click here to see a gallery of winners. Image courtesy of Krug, Inc. The Ascend Patient Recliner with Vertical Lift by Krug, Inc. was awarded Best of Competition. Ascend Patient Recliner with Vertical Lift, Krug, Inc.